Coal is a combustible compact black or brownish black sedimentary rock usually occurring in rock strata in layers or veins called coal beds or coal seams. It is formed from vegetation, which has been consolidated between other rock strata and altered by the combined effects of pressure and heat over millions of years to form coal seams. The harder forms can be regarded as metamorphic rock because of its exposure to elevated temperature and pressure. The quality of each coal deposit is determined by temperature and pressure and by the length of time in formation, which is referred as its ‘organic maturity’. The degree of change undergone by a coal as it matures from peat to anthracite is known as coalification. Coalification has an important bearing on the physical and chemical properties of coal and is referred to as the ‘rank’ of the coal. Ranking is determined by the degree of transformation of the original plant material to carbon. The ranks of coals, from those with the least carbon to those with the most carbon, are lignite, sub-bituminous, bituminous and anthracite. Low rank coals are typically softer, friable materials with a dull and earthy appearance. Higher rank coals are generally harder and stronger and often have a black and vitreous luster. Coal is composed primarily of carbon along with varying amounts of other elements mainly hydrogen, oxygen, nitrogen and sulphur. High-rank coals are high in carbon and therefore heat value, but low in hydrogen and oxygen. Low-rank coals are low in carbon but high in hydrogen and oxygen content. The relative amount of moisture, volatile matter, and fixed carbon content varies from one to the other end of the coalification series. The moisture and volatile matter decrease with enhancement of rank while carbon content increases i.e., carbon content is lowest in peat and highest in anthracite. The quality of each coal deposit is determined by the following. Classification of different types of coal into practical categories for use at an international level is difficult. Divisions between coal categories vary between classification systems, both national and international, based on calorific value, volatile matter content, fixed carbon content, caking and coking properties, or combination of two or more of these criteria. For convenience coal is usually classified into the following four categories. Initially the peat is converted into lignite or ‘brown coal’. Lignite is the coal type with low organic maturity. In comparison to other coals, lignite is quite soft and its colour can range from dark black to various shades of brown. Over many more millions of years, the continuing effects of temperature and pressure produces further change in the lignite, progressively increasing its organic maturity and transforming it into the range known as ‘sub-bituminous’ coal. Further chemical and physical changes occur until the coal became harder and blacker, forming the ‘bituminous’ or ‘hard’ coal. The International Coal Classification of the UN Economic Commission for Europe (UN/ECE) recognizes two brought categories of coal. This classification is adopted by International Energy Agency (IEA). Hard coal – Coal of gross calorific value greater than 5700 Kcal/Kg on an ash free but moist basis and with a mean random reflectance of vitrinite of at least 0.6. Brown coal – It is a non agglomerating coal with a gross calorific value less than 5700 Kcal/Kg containing more than 31 per cent volatile matter on a dry mineral matter free basis. Sub bituminous coal – This coal is having a gross calorific value between 4165 Kcal/Kg and 5700 Kcal/Kg. Lignite – This coal is having a gross calorific value less than 4165 Kcal/Kg. Coking coal – It is the hard coal with quality that allows the production of coke suitable to support burden in a blast furnace. Steam coal – It is defined as all other types of hard coal which do not have coking properties. These coals are also known as thermal coal or boiler coal. 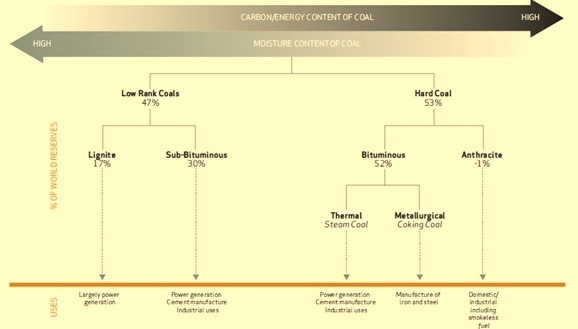 Different types of coal also have different uses, as shown in Fig 1. From lignite to anthracite all the members of the series are widely used as fossil fuel in different industries worldwide. The most significant use of coal is in electricity generation, steel production, cement manufacturing and as a liquid fuel. Different types of coal have different uses. Steam coal, which is also known as thermal coal or boiler coal, is mainly used in power generation. Coking coal, which is also known as metallurgical coal, is mainly used in the production of iron and steel. Coal used for pulverized coal injection into blast furnace has more narrowly defined qualities than steam coal used in electricity generation. Other important users of coal include alumina refineries, paper manufacturers, and the chemical and pharmaceutical industries. Several chemical products can be produced from the by-products of coal. Refined coal tar is used in the manufacture of chemicals, such as creosote oil, naphthalene, phenol, and benzene. Ammonia gas recovered from coke ovens is used to manufacture ammonium salts, nitric acid and agricultural fertilizers. Good article. Future article expansion could be use of coal for coke production.